Remember ages and ages ago, when I introduced you to this little chap? Well, him and his other amigos haven’t been forgotten. In fact, it’s very much the absolute opposite. 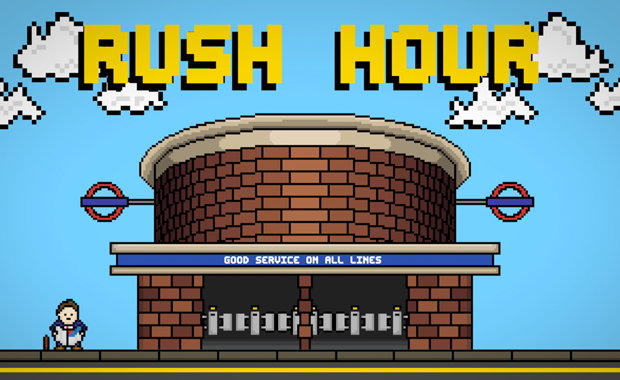 This project is called Rush Hour, the soon-to-be biggest 8-bit open world adventure app for iOS and Android. It’s a project that I have been working on solely for over three years with three redesigns. As a born and bred Londoner, I have been using the London Underground daily for many years. On my commutes I have experienced the daily struggles of being on the Tube; the city people stampeding past, the tourists who block the platform and those pesky people who commit the worst crime of standing on the left side of the escalator. But there are the good things too; the offering of a seat to an elderly person, the experienced commuters giving directions to the lost and strangers huddled around one Metro newspaper. I’m pretty sure everyone has their own tales, good or bad of the London Underground. It is these little stories and observations that have influenced me to make this game. I have currently finished the animation for the trailer and am waiting for the audio mix before I publish it. The official website RushHourApp.co.uk is also in development. I’m working around the clock to make Rush Hour into a working game for everyone to enjoy, so if you fancy yourself as an app developer guru then I’m on the lookout for you to join the team. Please contact me at antonia@rushhourapp.co.uk and let me know how you would like to get involved. To be kept up to date on all of the goings on, please like on Facebook or follow on Twitter.